Rock-a-bye baby, on the tree top. Be careful in that thing, or else it will drop! Today, parenting has a lot of rules. No blankets in baby's crib, no fluffy crib bumpers, and absolutely no sleeping on the tummy. The current parenting conversation revolves around natural remedies, attachment parenting, and the pros and cons of breastfeeding -- but let's take a step back to when parenting wasn't quite as gentle. And we're not talking about simply letting kids get super dirty or making them walk to school uphill both ways in the snow. If we can be frank, people back in the day did CRAZY things with their kids. We're talking putting their babies in a cage hanging out the window type of nuts. OK, OK -- we know it's not right to judge. But given that the seat belt wasn't even invented until 1959, it's safe to assume that everything before that time was extremely dangerous. Baby products were mostly made from metal or hard woods, had no support or precautions to keep baby protected, or, worst of all, were perched precariously where no baby belongs! Some of these contraptions were even used by doctors and scientist, which truly boggles the mind. Take a look at these horrifying parenting practices from the early 20th century and be thankful we live in a time when there is so much more known about babycare. And let us know -- which practice was the craziest of all? The question all parents ask themselves before a flight is do I buy a ticket for my newborn? Well, not anymore with this handy contraption. According to the Neatorama, scientists working for British Airways in the 1950s created this "skycot" to make traveling with a baby easier and more compact. Which could be a good idea if we weren't so worried about what would happen if there's turbulence. This ad found through the Library of Congress tries to persuade the consumer that this coffin on wheels is actually a stroller cover. A likely story, but all we see is a mom pushing her baby with the car from the Addams family. Nice try, 1800s advertising. Talk about precariously placed! If this baby fusses even a little he will fall so quickly from this scale -- which coincidentally looks like the type they use to weigh meat at the butcher's. A great baby invention? We think not. Just like how one would weigh fruits or veggies, this method of measurement is to place a precious newborn into a bucket to get the most accurate answer. Other methods of measurement used at the time: holding a baby with one hand and a sack of potatoes in the other to see which weighs more, trying to guess if a baby is bigger or smaller than another baby, dropping a baby and a feather at the same time from the top of a building and seeing which falls faster. None of which are recommended. Talk about a scary day at the hospital! This picture was taken in 1941 as part of a British air raid drill, and these gas masks for babies covered their entire bodies (except their feet?). Interestingly, these gas masks also double as the first baby-toting purse. Whatever this baby does, we hope it doesn't roll over! In a world full of safety guards, baby monitors, and car seats, it is almost impossible to imagine a parent putting a baby in a hammock to go to sleep. Hopefully this was the exception to baby's normal sleep routine. He'd fly through the air with the greatest of ease, that daring young man on the flying trapeze. What a photo! Too bad it scares the living daylights out of us. How is this kid sitting upright? 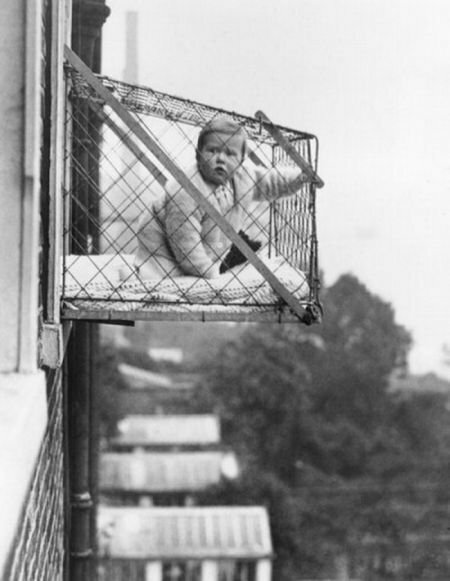 Believe it or not, in the 1900s parents were concerned about their children not getting enough fresh air as cities grew and more and more children were born within them -- and this was their solution. According to Popular Science, this steel cage can hold up to 500 pounds and was anchored to the window to protect it from strong winds. Tempting, but maybe we'll just stick to taking our kids to the park. The great granddaddy to the modern car seat. This thing has no straps or pads, and God help the parent who needs to brake quickly at a red light. From the looks of it, there isn't even a seat belt in that thing! But have no fear, though -- there are little safety features: The designer made sure that there was a steering wheel for a child to slam into. It's important to know that this ice skating carrier was created by a professional ... hockey player, not engineer. According to Big Think, player Jack Milford created the sling so that he and his wife could carry their baby on the ice. Well, that's one way to teach a baby to skate! At first glance, one might believe these leg clamps were to help children with polio, as it was a common affliction in the '50s. However, this invention was more rudimentary than it seems. The baby leg clamp was made to help children to learn to walk, and although they have gone out of fashion (or parents felt too weird about using a wooden child leash), there might be some merit in this idea. What could be nicer on a sunny day than to haul a cartload of toddlers around town? Well, take it from this nurse and this donkey -- it probably was all fun and games until one of the babies starts crying. Crazy level: 100. Unlike the baby incubators of today, the baby incubators of the past strove to have a rocking function. Not a totally bad idea, but there is something about this that seems like opening up a breadbox. Thank goodness that incubators look a little more professional now. It had been proven that music in the womb can be helpful to a baby's brain development. But what about this gadget that comes with its own electrical lines to power the speaker attached to baby's carriage? There's no way that this is safe. This carriage should come with a warning: DO NOT use during thunderstorms. Apparently baby stealing was a much more serious problem in the '30s than one might have guessed. Using a UV light, this machine brands the initials of an newborn child into the skin so the child is not mistaken for another child. Given what we know now about tanning bed, this technique from the past sends a shiver down our spine.